Yesterday most of the world didn’t stop to commemorate the loss of life at the World Trade Center on September 11, 2001. That’s OK: it’s a big world, and there is suffering enough to go around. Perhaps that’s why I found many of the images from New York to be somewhat garish: crowded, busy, cluttered with symbolism, and ultimately self-absorbed, they were awkward photos of a scene that already is more about the present than the past. So let me offer another image in their place. This isn’t New York, but rather a street in Kabul. That’s one way that 9/11 is still a global event, and one where the loss of American lives and treasure continues. 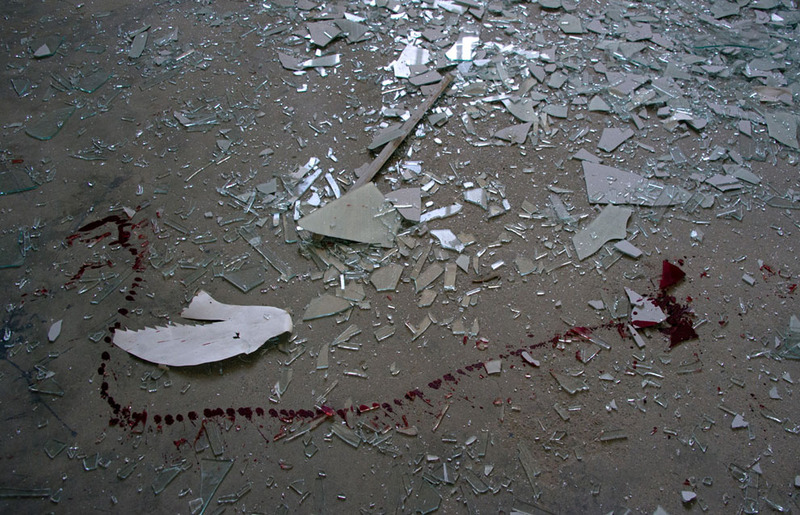 The splintered glass is from a school that was lacerated by a suicide blast next door. The blood—well, that didn’t come from the masonry. Those shards will have flown like shrapnel. Terrorism, like torture, like any war in a civilian environment can traumatize not only with the weapons themselves but also by turning the furniture of everyday life into instruments of horror. The joke is lame, but it points toward something better. The abstraction in this composition provides important elements for serious remembrance and reflection. Lives were shattered and can never be put back together again. Rich, red blood continues to be spilled, many times over the death toll of eleven years ago. The closely cropped image reminds us that just about everything else is outside the frame, part of a much bigger world where life goes on regardless of what happened to you and yours, or to those who died this past week, month, or year because the root causes of terrorism still haven’t been addressed adequately and the unintended consequences of US military actions still haven’t been remedied. The image is both elemental in its concentration on the ground-level facts of violence and comprehensive in its suggestion of how much goes unseen, misunderstood, and mishandled. The abstraction works in another way as well. Glass is an optical instrument, like the camera taking the photograph. Perhaps the lens supplies a missing wholeness, a restoration of order in the aftermath of its destruction. One can indeed trace lines, a vector, an organic outline in the array from lower left to rear center, but that is a small consolation. Better, I think, to see each sliver of glass as a fragment of perception or experience or memory. Violence attacks not only individuals, but also our collective resources for remembering and empathizing and understanding, that is, for seeing a good life held in common. Each piece of glass stands for some small part of a larger understanding of the events of that day and of the long decade behind us. Every time a bomb goes off, more lives are broken. Every time violence expands, the bonds of community are damaged. Every day the blood-letting continues, the world’s collective capacity for peace is diminished. Photograph by Johannes Eisele/AFP-Getty Images.